The impact of iron and vitamin D supplements among adolescent is not well understood. The prevalence of supplement use, and the behavioral intentions of adolescents was studied to better understand the data on supplement intake. We used the theory of Planned Behavior (TPB) to explore the determinants that influence supplement intake, and its potential constructs to examine determinants that influence dietary supplement behavior towards the use of iron and vitamin D supplements amongst a sample of Iranian schoolgirl. This was a cross-sectional study of 485 adolescent girls aged 12–17 years. Multiple analytical models including hierarchical regression and structural equation modeling (SEM) were used to examine the association between TPB constructs and adolescent’s behavioral intentions to consume dietary supplements. Based on the results of SEM, constructs of TPB and knowledge were found to predict 74% of the variation in the behavioral intentions of the schoolgirls. SEM indicated that perceived behavioral control (PBC) and knowledge had significant associations with intention behaviors to take nutritional supplements. TPB and its constructs were used to establish the determinants of iron and vitamin D intake among schoolgirls in Iran. This outcome indicates that efforts to promote behavioral intentions through targeting subjective norms, attitude, and PBC may promote supplement use. Children who are entering adolescence need to consume adequate dietary micronutrient because they are going through many significant physical and intellectual changes [1, 2]. Several studies have reported that adolescents who consume a diet rich in micronutrients, have a lower risk of and cardiovascular diseases than those with a dietary pattern that is high in animal proteins, carbohydrates and fats, and lower in micronutrients [3–5]. The transition to adulthood is also considered to be a critical time for dietary intervention to improve long-term health behavior and responsibility for diet . Previous studies have indicated that dietary interventions can improve long-term health behavior and lead to periodic changes in nutritional intakes and dietary behaviors in adulthood [7–9]. Deficiencies of iron and vitamin D are common in the adolescent population, which can have a negative impact during phases of rapid growth, increasing susceptibility to infection, autoimmune and other chronic disease and also impair mental development and learning [10, 11]. Dietary iron is mostly present in animal products (e.g red meat, fish, egg), certain plant foods and legumes. The main sources of vitamin D include dairy products, egg yolks, seafood and fruit juices. Numerous studies have identified an association between poor iron status and low Vitamin D concentration. Vitamin D deficiency is associated with an increased risk of deterioration of iron status and anemia [12–14]. It has been hypothesized that vitamin D may influence iron metabolism and erythropoiesis, while iron, in turn, is essential for the synthesis of vitamin D [12, 13]. According to the National Family Health Survey in Iran, 14–18% of girls suffer from iron deficiency anemia and 31% were reported to have insufficient iron stores . In Iran, 14% of adolescents under the age of 18 suffer from iron deficiency anemia [16–19]. Current estimates indicate that vitamin D insufficiency/ deficiency is a common health problem, affecting 1 billion people globally, and 40–100% of European and American elderly men and women suffer from these deficiencies [20, 21]. The results of the meta-analysis study in 2018 in Iran indicated that the prevalence of vitamin D deficiency in men, pregnant women, and all women was respectively 46, 60, and 62% . Whilst there may be sufficient levels of sunlight in Iran, the high prevalence of vitamin D deficiency may due to the types of clothing worn, dietary habits (low consumption of dairy products and seafood), lifestyle, air pollution, and skin pigmentation . Numerous studies have shown that prevalence of vitamin D deficiency among women population is higher than for men in Iran [23–25]. This has been explained in terms of social obligations and cultural aspects. In Iran, women and girls (age > 9 years) are instructed to dress with full body covering that is usually dark and solid in coloration. This degree of covering allows for the entire face to be revealed, while continuing to cover the hair by wearing a scarf. Studies have indicated that skin covering is an important risk factor for vitamin D deficiency because it limits exposure to the sun and the level of vitamin D absorption [23–25]. To combat vitamin D and Iron deficiency in Iranian adolescents, a national program of supplements of iron and vitamin D is being conducted routinely in Iranian high schools for female students by the Health ministry. According to this program, 16 iron pills (Iron (II) fumarate), and 9 pearl vitamin D3 are given to students weekly and monthly, respectively. Despite, several studies that have shown that the positive effect of this supplementation programs (WIFS) in reducing the rate of vitamin D and Iron deficiency, a national report showed that the prevalence of anemia and vitamin D deficiency among Iranian adolescents remains high, and this may be explained by the refusal of adolescents to take these supplements [15, 22, 26–28]. Although efforts have been made to modify supplementation programs in Iran, the effect of behavioral intentions and attitude toward Iron and vitamin D intake have not been studied systematically, especially with respect to high-risk groups. It is still unclear what/how potential determinates can affect/impact adolescent’s attitude and intention to regular intake Iron and vitamin D [15, 16, 29, 30]. In recent decades, theories of public health have been developed to improve the health promotion behaviors to use food supplements among adolescent . The theory of planned behavior (TPB) is a practical theoretical perspective to evaluate factors influence individual’s decision to engage in an specific behavior [32–34]. This theory links an individual’s attitude and behavior, and states that attitude and belief toward behavior, PBC, and subjective norms, together shape an individual’s intentions to engage actual behavior at specific place and time [35–38]. Therefore, in this study, we hypothesized that TPB could be a fundamental framework to identify and explain the main determinants that may affect iron and vitamin D supplement intake in Iranian girls. With a view to providing a basis for future studies, we aimed to (1) test the fit of the TPB; (2) to explore potential determinants that influence dietary behavior toward iron and vitamin D supplementation in female adolescents; and (3) to estimate the extent of the relationship between supplementation knowledge, attitude, subjective norms, and perceived control of behavior and intention towards intake of vitamin D and iron supplements. This cross sectional study was conducted on 485 female high school students from Gonabad city (a city in the southeastern province of Khorasan Razavi, Iran) in 2017. We divided the city into 8 regions based the existence of high schools and population density. We then used random sampling to select 16 schools from 32 school and all students in these selected high schools were considered for recruitment if they (a) were able to complete all questionnaires; (b) had normal physical health; (c) could speak and read Persian language (their native language); and (d) lived in Gonabad city over the previous six months. Students were excluded if they unwilling to participate or were unable to give informed consent; had suffered mental disturbance, upper limb disability, and visual impairment. A total of 485 student age 12–17 were involved in this study. Among all participant invited to take part, 5 refused to participate and 480 students were finally included in the data analysis. We explained any unclear questions and informed all participants concerning the aim of this survey. All eligible students gave written informed consent. Data was collected by questionnaires that consisted of three parts: a) Demographical properties questionnaire b) Knowledge evaluation questionnaire c) supplement assistance of iron and vitamin D using the constructs of the TPB questionnaire. The evaluation and validation of the questionnaire was conducted based on the comments of the group of experts (3 nutrition experts, and 5 health education experts), Content Validity Ratio (CVR) and Content Validity Index (CVI) were calculated. The CVR and CVI of the questionnaire were 0.90, which was acceptable. The questionnaire was used in a pilot study of 50 students to make sure that the questions were clear and understood by the girls, and the average of Cronbach’s alpha was 0.88 for all the structures of the planned behavior theories which was acceptable. The questionnaire of demographic factors included student’s age, parents’ age, residence, and the parents’ employment status and education level, were reported by the participants in a self-reported questionnaire. We designed a new questionnaire to examine the effect of potential constructs of TPB and knowledge on adolescent consumption behaviors. This questionnaire consisted of 27 questions that examined knowledge and items from the TPB (Azjen, 1991). To measure the level of knowledge, 9 questions were designed to examine what adolescent knew about the importance of iron and vitamin D supplements, and their effect on health outcome. These question were answered using a two-dimensional scale (right = 1, wrong = 0) [37, 39, 40]. The last 18 questions examined attitude, PBC, subjective norms and behavioral intention together affect Iron and vitamin D intake. To measure these constructs, the Likert scale had five options from strongly agree to strongly disagree. Further details related to questionnaire and their items were summarized into Table 1. We used SPSS software (version 22) to analyze the data to provide descriptive data, and a multivariate model. Data were also tested by maximum likelihood estimation of a confirmatory factor analysis (CFA) method using the AMOS software for Windows, version 24. The CFA analysis allowed an assessment of the adequacy of the TPB and its constructs to present the process was surveyed and to estimate association among constructs (knowledge, attitude, perceived behavior control, subjective norms, and behavior intention). The evaluation of the model was conducted using fit criteria for the following indices: chi duo square Indicators (x2), Chi duo square ratio to degree of freedom (x2/df), root mean square error of approximation (RMSEA), adjusted goodness of fit index (AGFI), goodness of fit index (GFI), non-normed fit index (NNFI); parsimonious normed fit index (PNFI), and partnership intention (I) . The model was considered to be a good fit if the (x2/df) < 5, RMSEA ≤0.08, SRMR < 0.05, AGFI > 0.8 and other indices (NFI, GFI, TLI) more than 0.9 [41, 42]. The mean (standard deviation) for students’ age, father’s age, and mother’s age were 12.76 (0.63), 43.32 (5.64), and 39.22 (5.41) years respectively. In total, 329 (68%) of the students were residents of the city and 151 (32%) were residents of the surrounding villages. Most of parents (74%) had a diploma degree. 72% of students’ fathers were self-employed and 83% of mothers were housewives (Table 2). According to the regression model, socio-demographic variables accounted for 2.3% of the variance of behavioral intention. In this population, only residency location and father’s age were found to be associated with behavioral intention at the significance level of 0.05 (Table 3). Before conducting the analysis of the verified factor, the data for outliers and the normality of variables were examined, and the outlier data of each observation were analyzed by Mahalanobis distance and if necessary were omitted . In the analysis of critical ratio of skewness or kurtosis of the variables, and the state of being multi- variable normal was verified, and as a result, a maximum likelihood method was conducted to estimate the parameters . After performing the CFA analysis test, the knowledge (9 questions), attitude (4 questions), perceived behavioral control (PBC) (5 questions), subjective norm (6 questions) and behavioral intention (3 questions) remained in CFA. The goodness of fit for the measurement of CFA was acceptable (X2/df = 2.17, RMSEA = 0.04, AGFI = 0.89, GFI = 0.91, PNFI = 0.64, PCFI = 0.73) (Table 4). 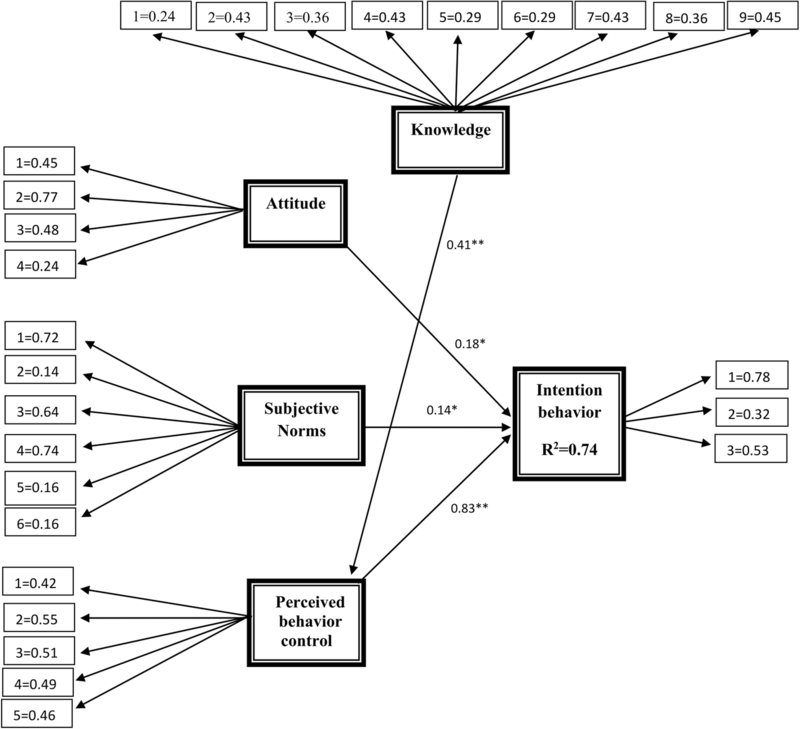 To analyze the relationship between the four exogenous constructs (knowledge, attitude, PBC and subjective norm) and endogenous construct (behavioral intention), the structural equation modeling (SEM) was used. The assessment of the SEM showed a good fit of indices: X2/df = 2.57, RMSEA =0.05, AGFI =0.87, GFI =0.90, PNFI =0.60, PCFI =0.67 (Table 4, Fig. 1). In summary, planned behavior theory and the knowledge structure explained 0.74 (with Confidence intervals 99% is 0.683–0.788) of the variance in the students’ behavior intention to take an iron supplement and vitamin D (Fig. 1). In summary, the results suggested that, there was significant direct effect of attitude (standardized path coefficient (SPC) =0.18, p < 0.05), subjective norm (SPC = 0.15, p < 0.05), and PBC (SPC = 0.83, p < 0.001) on behaviors intention, indicating about 82% of the total effects on behavior intention. Likewise, there was a significant indirect effect of knowledge (SPC = 0.34, p < 0.001) through enhancing PBC with 18% of the total effects on student’s intention (Fig. 1, Table 5). Among all constructs of planned behavior theory, PBC constructs were the strongest determinant (p < 0.001) for behavior intention compared other constructs, indicating about 44% of the total effects on behavior intention (Table 5). This study examined the effects of psychosocial characteristics and individual’s knowledge on adolescent’s intentions to use iron and vitamin D supplements in Iran. Our results showed that socio-demographic variables had no significant effect on behavioral intention. Similar findings were reported previously which found that demographic characteristics exerted little effect on the intention behaviors [37, 40, 45]. Our finding suggests that an individual’s knowledge toward dietary vitamin D and Iron was moderate (4.58 from 9) (Table 1). Most adolescent (60%) in present study were aware of the potential health outcomes (such as calcium absorption, intelligence quotient, and delayed physical growth) associated with Iron and vitamin D deficiency. Likewise, our results showed that most of adolescents (> 50%) were not aware of some preventive effects of vitamin D and Iron supplementation (e, g., anemia and the immunity of the body) common in old age, and the focused on the here and now. This finding were in line with several studies on young adults and adolescents, who have been considered as “young invincible” because of their disregard for future health consequences [46, 47]. Furthermore, testing SEM helped to explain that total effects of knowledge resulting from significant indirect pathways. Our findings showed that indirect effects of individual’s knowledge were negatively mediated by perceived behavior control. The majority of previous studies reported the direct routes of individual’s knowledge on intention behaviors, failed to observe indirect effects [37, 48, 49]. This present work lends some support to the results of an American women and Canadian young adults studies performed by Heather Petraszko (2013) and Goodman (2015), who observed the effects of individual’s knowledge on behavioral intention could be mediated through constructs of perceived behavior control [37, 40]. The results from testing SEM showed good fit between the constructs of TPB and data, indicate all the significant paths were in the expected direction as it was reported by Heather Heather Petraszko (2013) and Goodman (2015) on the frequency of nutrition multivitamin/mineral use among American and Canadian young adults [37, 40]. Interestingly, our finding showed that the constructs of TPB are able to explain 74% of total variance of individual’s intention to use iron and vitamin D supplements. This is in agreement with several studies utilizing the application of TPB to predict nutrition and dietary supplements [48, 50]. Hagger et al. (2010) indicated the predictive relationships between key construct of TPB (i.e., attitude, subjective norms, PBC, intentions) and young adult’s intention to use multivitamin/mineral as well as the frequency of supplementation . Ajzen have suggested that TPB as an appropriate choice to predict and explain people’s intentions and behavior to use fruit, vegetable and nutrition intake [50, 52]. Among all the constructs in this study, PBC emerge as the strongest direct path of intention, that mediates the effects of knowledge on individual’s intention to use dietary supplements among adolescents. Our finding suggests that adolescent who have a higher perception and cognition, show a greater intention to engage in iron and vitamin D consumption on a regular basis despite various conflicting situations. This is consistent with TBP assumptions and other similar studies that have indicated perceived difficulty or ease of performing the behavior significantly influence the individual’s intention to perform the behavior [50, 53, 54]. In present study, attitude positively affected individual’s intention, which was consistent with the TPB. Significantly, around 60% of participants either disagreed or strongly disagreed with the specific attitude statements include “getting enough iron and vitamin D through food and I do not need to eat supplements”. Likewise, close to half of participants believed that these supplements do not cause serious health problems in their body. Thus, most of participants possessed a positive sense and belief concerning the benefits of consumption of dietary supplements. However, some subjects (32%) believed that the use of supplements is harmful for their body and should be provided through food intake. A number of studies have found evidence that a high positive sense and attitude toward healthy behaviors is more likely to promote an individual’s intention regarding personal goals, such as supplement use [37, 51, 53]. We found that subjective norms positively affected intentions; accounting for 13–15% of the explained variance. Our finding indicates that friends, fathers and teachers had a great influence, by acting as role models and giving social support. This result was consistent with other studies that reported social influences, such as parents; friends and family doctors could potentially lead to long-term changes in adolescent’s intentions and behavior [50, 52, 53]. This study is not without limitations: however, these shortcomings explained here can be applied as guide for other studies in future. Our participants were selected from female adolescent population (aged 12–17) who were living in Iran. Our findings may not be generalizable to younger or older population. Secondly, this result generated from strategies in present study to regular intake Iron and vitamin D information may not be applicable for other dietary supplement, with long-term health implications such as omega-3 and calcium. Therefore, future testing of the TPB with longitudinal data among other populations and dietary supplement would be useful to examine whether results are comparable. Thirdly, although the use of self-reported questionnaire and a cross-sectional data is common in TPB assessment , it may have led to conceptual problems in the causal inferences of the TPB and let to over representation the associations among constructs of TPB. Thus, it must be noted that the predictors likely are less strongly associated with consumption of supplements among adolescent than what was observed in present study. We acknowledge that this study would have been more effective if the education intervention had been conducted and its effect were measured in changing the adolescents’ intention and behavior. Thus, further study should focus on longitudinal data to assess effects of TPB-based interventions on changing young adolescents’ intention and behavior. This study provides support for the effectiveness of TPB and its potential constructs in testing for the determinants of iron and vitamin D supplement intake among adolescent in Iran. We found that knowledge, subjective norms, attitude, and PBC could be potential determinates to explain and predict female adolescent’s intentions regarding vitamin D and iron consumption. PBC was the strongest construct of TPB at predicting people’s intentions to use iron and vitamin D.
This study suggested that an individual’s knowledge, attitude, subjective norms and PBC may influence the level of intention behavioral to intake dietary supplements. Identification of potential determinants that influence effective behavior change could be useful for health promoters and public health policy educators to better perceived adolescent’s needs and intention to intake dietary supplements. Ali Alami and Seyedeh Belin Tavakoly Sany contributed equally as first author to this work. The authors would like to express their deepest appreciation to the students, managers, teachers, and staff in the Social Determinants of Health Research Center who assisted the authors to run this research project. Authors AA and AJ designed the study. SBTS, ELM, GF, MT and ZH participated in the conception of the study. MT and AJ managed and conducted the statistical analyses and interpreted the data. AA and AJ wrote the first draft and SBTS, ELM, GF, MT and ZH revised it to make the final manuscript. All authors have approved the final manuscript. This study is based on a research project approved by Ethics Committee of Gonabad University of Medical Sciences with the code of ethics IR.GMU.REC.1394.99. All procedures performed in this study were in accordance with the ethical standards of the institutional and/or national research committee and with the 1964 Helsinki declaration and its later amendments or comparable ethical standards. Informed consent was obtained from all individual participants included in the study.